Cumbria SACRE has designed the Buried Treasure project to give students direct experience of the sacred texts of different religions. Exposure to the source of these religions allows the students to encounter the beliefs different from their own, to break down barriers constructed through ignorance and fear of the unknown, and to challenge the resulting stereotypes. They discover the common ground in the different religions and build confidence in their own understanding of them. The project is a stimulating one day event. Students will consider the proposition that the sacred texts of the world religions have an important role to play in creating a better world for everyone. They will be invited to adopt the approach of scientific explorers. To see themselves as setting off to collect evidence and test it out. To question if it is possible that answers to many of the problems facing the world could be found in these religions? What they discover will be precious and valuable and therefore their discoveries should be treated with respect and preserved for the benefit of others. To begin with there will be a simple exercise to assess their ‘position’ in relation to religion in the world today. It requires them to move around the room and stand by the answer that best suits their thinking in response to a question and take up a position. They will be given a few minutes to write down their thoughts. Then they will work in small groups to investigate the value of certain concepts or virtues such as love, and justice. There will be a challenge or ‘experiment’ to complete at each station and a set of quotations on that specific theme from various sacred writings for them to find and collect. Their research requires them to talk to faith representatives who will be present. Together they can explore the value or relevance of these writings in today’s society and in relation to the results of their ‘experiment’. They will collect the quotations or ‘gems’ which are written onto diamond shaped paper and placed in the relevant place in the sacred books. Once all the groups have been to each of the stations and collected the quotations they will create a treasure chest to keep the gems in. Several treasure chests will be created and the students can work alone or in pairs to create as many artefacts for their treasure chest as they want. The quotations could be used as they are on the card and attached to an article or could be rewritten directly onto an item. They will be asked to look again at the notes they made at the start of the day and reflect on whether or not their position has changed at all? Then there will be a question and answer session with the panel of faith representatives. The day will end with some reflective time where some of the quotations will be read aloud. The schools involved will each get to take a treasure chest back to their school. A similar exercise could be run in a classroom or the treasure chest could be used as a starting point for other students to explore and discover sacred texts. 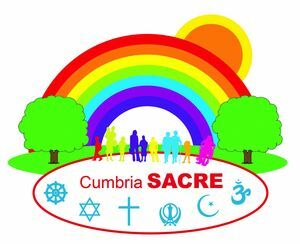 Cumbria SACRE supports high quality teaching and learning in RE and thoughtful, reflective experiences in collective worship. 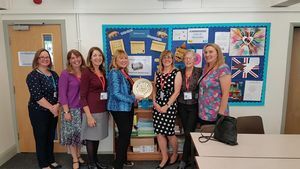 We aim to enhance the provision of RE within Cumbrian schools and encourage the provision of high quality in-service training for those with responsibility to deliver it.